The Equivalent Of 176 Floppy's In My Pocket? Yes Please! Now, I know most of you will probably have one of these, a USB Flash Memory Drive, but I only got one recently, and it's one of the most useful accessories I have ever bought for my PC since a mouse with a scroll wheel. Why are USB Dongles so good? Well, I always had a problem with transferring data between non-internet or network connected pc's. Floppies? Too small. CD-R's? Ok, but not re-usable and fragile. The USB drive is perfect, just plug it in and you have instantly another hard-drive on your pc, ready to take any type of file you want & transfer it to or from the drive. My USB Data stick came in most useful at work, where our PC's are hand-tied and don't have proper internet access - I couldn't easily move large files to my home pc. With the USB dongle, I just plugged it in, a window would pop up and I could move any files I wanted to, great! 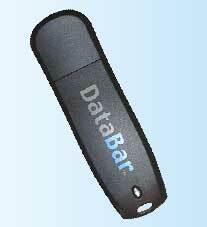 The model I use is a DataBar 256mb USB 2.0 dongle, and it is fast and reliable. It hangs from a lanyard around my neck, ready for action anytime, it's almost as useful as my XDA at work! Now they're available for just a few quid, just get one, you'll be amazed at how many uses you'll put it too!